They may not have had salt, but they were still Regularly cut Chips that had been fried in oil. The crispy, snappy crunch was still there. It may have been mind tricks, but they did not seem to melt as quickly in the mouth as the main variety. There was no discernible difference between these and the regular Barbecue flavor, although the potato slices did maybe seem a little more blanched and pale. The oil bubbles were the same, the spread of unevenly coated orange seasoning was the same. There were some broken edges and incomplete Chips. 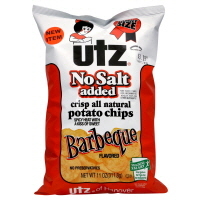 If a doctor tells you that you should reduce your salt intake it is great to know that you can still eat Potato Chips. Even flavored Chips. What you will not be able to tell from the front of the bag is that all the other numbers on the nutrition label are still there - these are not a healthy alternative. So, what about taste? Well, it is hard to say. The flavoring was all still present as if ticking boxes. But the flavor was not. Salt enhances the flavor of a potato in Chips. Perhaps this is why they have grown so popular over the years. Maybe we would all eat paper doused with seasoning if we did not want to taste potato. It all got a little confusing. Despite our low marks, we would urge people to try them, and feedback is welcome because we don't think we really got what was going on here.